robot pirate scorpion – computers, bikes, etc. 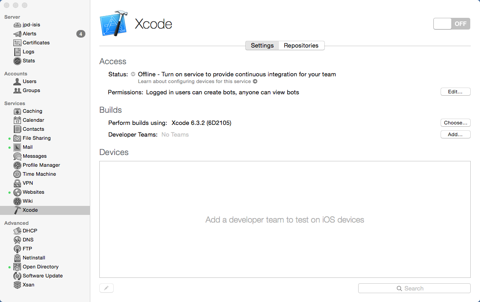 Xcode comes with some powerful testing and Continuous Integration functionality built-in. This article will give you a basic introduction to using these tools and show you how they can help write maintainable, testable code. We will walk through the process of setting up a spare computer to do continuous integration. This computer will monitor a repository, run tests, and then produce a report when the repository has changes made to it. Having a spare computer do continuous integrations means you don’t have to do this manually. 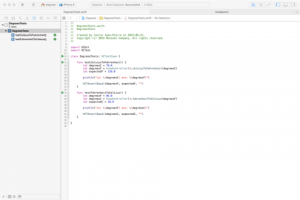 Developing apps involves writing code and then pushing it to a repository. After that, if you want anyone to see/use it, you have to distribute the code. You can automate the process that runs tests (to confirm the code that you’ve committed does what you want it to do and doesn’t break anything in the process) then make it available to those who need it (clients, managers, testers/QA, etc.) While testing is a simple way to catch regressions before they make it into a user’s hands, writing and running tests will help you write modular, testable code. 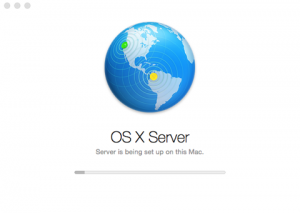 Download and install OS X Server on the second Mac (the remote machine). 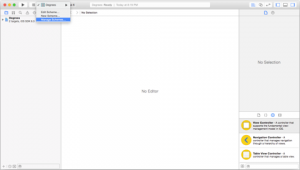 It sounds like we’ll be reinstalling OS X, but really it’s just an app. We will be using OS X Server 4.1. It costs CAD$22.99 on the Mac App Store unless you qualify for the Up-to-Date program or if you are a registered Mac or iOS developer. Enter the domain name. 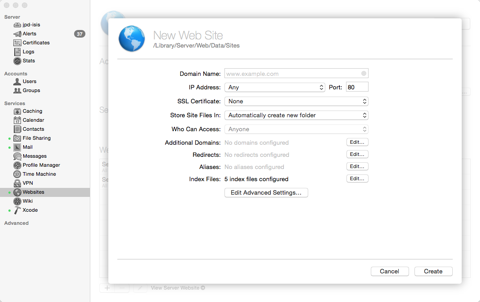 (Optional) Change Store Site Files In to point to the folder where you will put your website’s files. Check that the domain is running. This is where we will see the results of each integration. 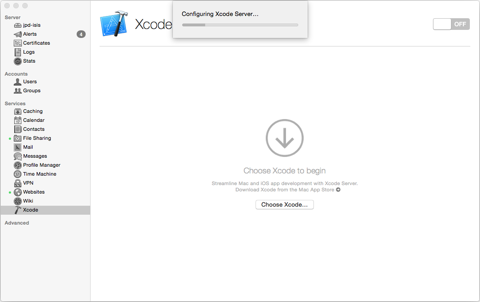 Xcode Server is actually just regular old Xcode. You will need to have it installed in order to complete the remaining steps. 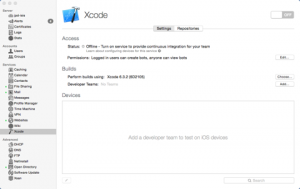 Once it’s installed, select Xcode from the services list on the left then click Choose from the Builds section. This step will take a while. 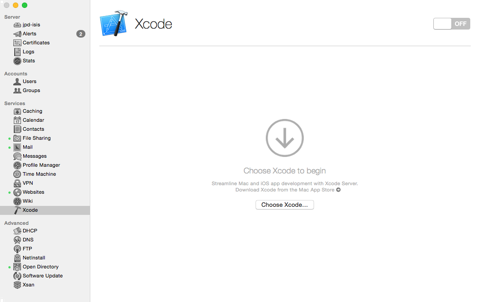 Next we will choose the version of Xcode to work with. If you have several versions installed, this is the place to specify which one you will use to run the automated builds. 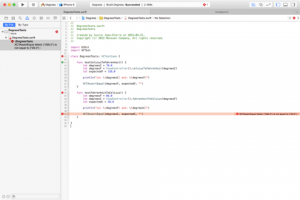 Now run it by clicking the toggle switch to turn Xcode Server on. This step will also probably take a while. Be patient. So what is a bot? It’s a process that is responsible for carrying out a task on your project. A bot can be responsible for simply building the project or it could be configured to do more advanced tasks like analyzing performance, running a test suite, and/or archiving your app. This is where we will set up a bot to build and test our sample application. Before we set up a bot, we need to create a scheme. A scheme is a set of guidelines that tell the bot what to do and when (eg. “build and test my app any time I check code into the master branch”). 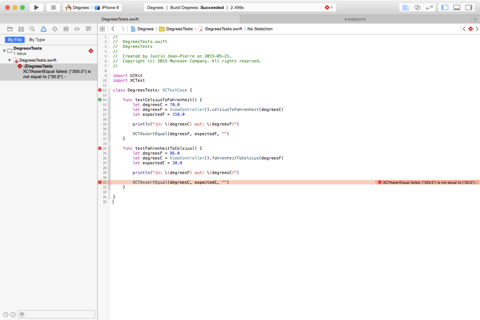 This is specified in the Xcode project. We will need a project to work with. 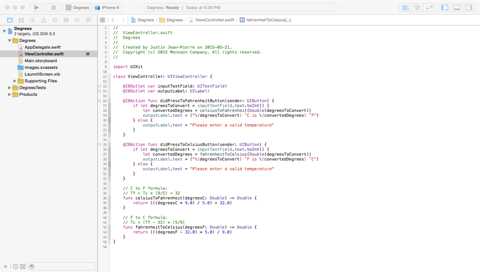 We are going to use the Degrees sample project to test our Xcode setup. Clone the sample project to your local development machine. It should build without warnings or errors. There are two tests that we will run after we have our bot up and running. 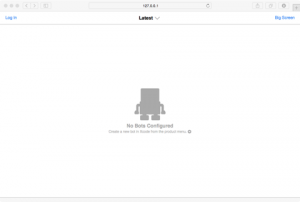 You will need to change the remote location to a repository where you have write access. THIS IS VERY IMPORTANT! It is where you will be committing your code from your development machine. 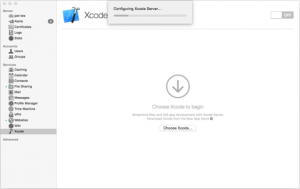 It is also the repository that Xcode Server will monitor for changes to start a build. You can put this on a schedule if you prefer; more on that later. 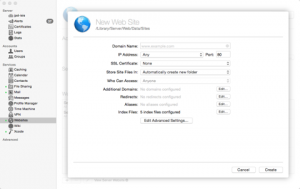 Check the Shared box and close the schemes pane. Commit this change to your repo and push it. 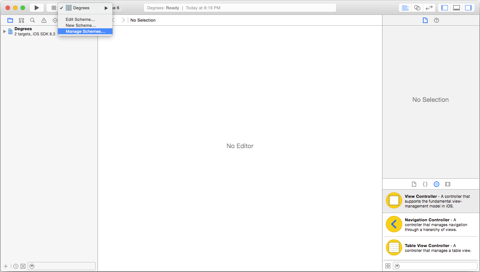 (Pro tip: Make sure that this file isn’t ignored in your .gitignore). This is the fun part where we configure our bot to do stuff! Log in to your remote Mac. This is where we’ll be setting up Xcode’s first bot. Clone the project, then click Product > Create Bot. Enter a name for it, and add your server’s address (the IP address of the remote machine that will run your bots). 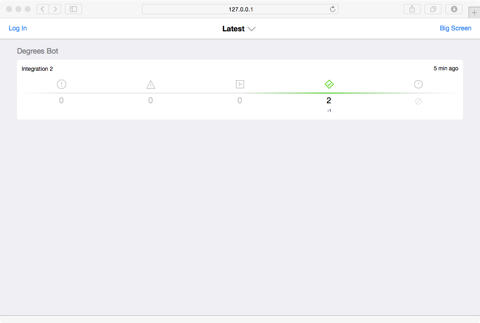 Leave the Integrate Immediately box checked so that the first integration will run as soon as the set-up process is finished. You will need to provide your repo credentials here. After providing your credentials we can set up a schedule. 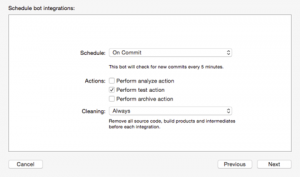 We’re going to select On Commit for the bot’s schedule and select only Perform test action for it’s actions. 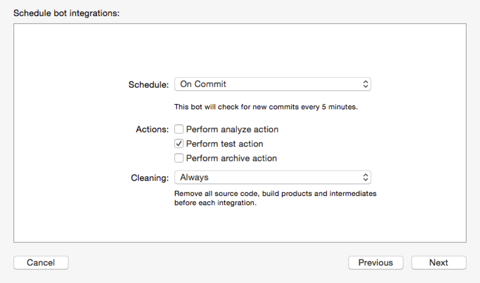 Checking the Perform analyze action box will make Xcode run static analysis on your project. This is useful for catching memory leaks and other fun surprises. 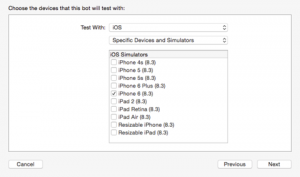 We can choose which simulators will run our tests. This is great for functional testing to make sure the UI is consistent across display sizes. For now, we’ll just select the iPhone 6 simulator. Next we can specify triggers for before and after integration. 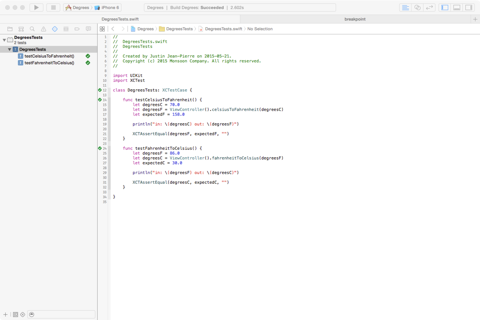 For example, in the project my team is working on at Kunai we have a script that updates the build number in Xcode before each run. Choose whether you want to be notified of build errors, failures, etc. then click Update. Our bot is configured and waiting to be triggered by a commit to the repository. Clearly, we’ve got a problem here. We see that the application built without errors, warnings, or issues but one of the tests failed. Specifically, it looks like there’s something wrong with the conversion from Fahrenheit to Celsius. Let’s fix that by changing the 50.0 to 5.0 in fahrenheitToCelsius(degreesF). We could run the tests locally or we can let our fancy new integration take care of it. Normally we would test and analyze our code before committing, but this is a trivial (and contrived!) example, so we’re going to let our bot handle it this time. Commit and push the code. We should see the test pass. 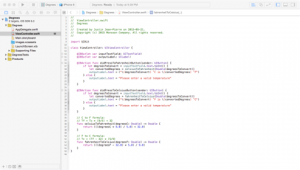 Xcode polls the repository periodically, so you may not see the bot start right away. Give it a few minutes. Once the next integration is finished we can check the results: no errors, warnings, or issues and both tests passed. Now that we’ve got the results we want, this integration cycle is complete. 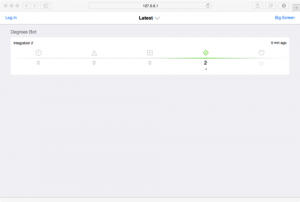 In the future, it will be easy to monitor integration results (by clicking here) and we can be assured that we have one more tool to help catch regression bugs. 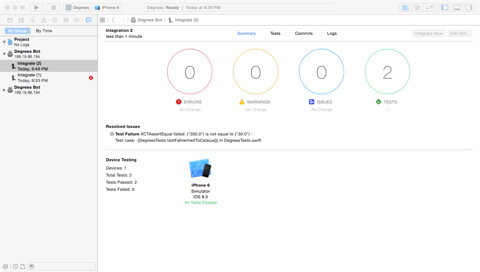 Through those activities, we learned why CI and testing is important as well as how easy it can be to get started testing applications by using Xcode’s built-in tools. Validate the input. The user can input anything into the text field. Make sure that only numbers have been entered before converting. Validate the output. The converted temperature is displayed with several digits after the decimal places even though we don’t need more than one. Change the output to show only one digit after the decimal. Move the conversion functions out of the view controller. This project doesn’t stick to the MVC pattern. Change that by creating a model for the units and having the controller talk to it then update the view accordingly. This will also make testing easier in the future as the model and the controller aren’t mixed together in one file or class. Add email notifications for build results. 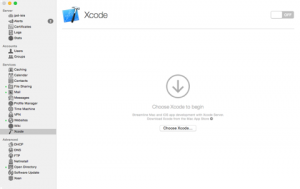 We’ll pick up from here and discuss Xcode 7’s new features in the next installment. So I went on a tour of the CSA today. For those of you that don’t know, the CSA is our NASA, only on a much, much smaller scale. As you might imagine, access is highly restricted and pictures were strictly forbidden. So I took some covert spy shots. Since I promised not to put them on the internet, I’ll be posting them here soon. The tour was divided up into three sections. The first session was a description of antenna engineer Jerome’s day-to-day activities. He said his work mostly involves coming up with new antenna configurations and repeatedly solving Maxwell’s equations. The second session consisted of presentations by Walter and Matt about their journeys to the CSA and the projects they are working on. Walter talked about his role- it had something to do with fluids and computation and went right over my head. It was good that they spent some time talking about the CSA’s hiring process and their selection criteria, but bad that I won’t exactly qualify for a job there. It looks like a cool and interesting place to work. Matt the life support guy showed us his remote experiments on greenhousing and talked about some issues surrounding agriculture in space. If you are going to mars, for example, you’ll end up staying there for at least 18 months. What will you eat? Can you even bring enough food with you? Would it be possible, or easier, to just grow it there instead? This leads to some other interesting questions: How do plants grow in low-gravity environments? How would they grow on the moon, where one lunar day lasts the equivalent of two weeks on earth? Finally, we were shown Canadarms 1 and 2, and Dexter- a smaller and more dextrous companion to the now-outdated Canadarms. It turns out that the arms on the International Space Station can also be controlled from the ground, but the communication lag is too long for that to be done in all but the rarest circumstances. The ISS can also be “driven” like any other mobile home and, in fact, needs to dodge space junk regularly. Since the average piece of debris is traveling at about seven kilometres per second even the smallest collision can be disastrous. The trip to the CSA was a fascinating reason to skip class and I’m jealous of the fellow Concordians that I ran into who get to work there.